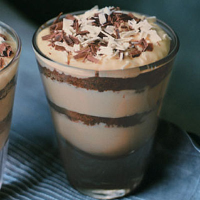 Alternating chocolate layers make this a stunning dessert. Prepare the cake layers the day before you plan to assemble the tiramisu. Preheat the oven to 170c, gas mark 4. Butter the base of a 23cm springform tin and line with baking parchment. Beat together the butter and sugar with an electric whisk until light and creamy. Gradually add the eggs and vanilla extract, mixing well between each addition. Stir in the melted chocolate. Sift over the flour, cocoa powder and bicarbonate of soda, add the soured cream and beat until smooth. Spoon into the prepared tin, spread level and bake for about 35–40 minutes or until a wooden skewer inserted into the middle of the cake comes out clean. Cool the cake in the tin for 10 minutes, then invert onto a wire rack. Once cold, wrap it in clingfilm. To assemble the tiramisu, use a long serrated knife to cut the cake horizontally into 3 even slices. You will only need 2 slices for this recipe (wrap the remainder in clingfilm and freeze to use in future trifles or desserts). Spoon a layer of the mascarpone cream into the bottom of each of 8 glasses and top with a layer of cake (cut to the diameter of the glasses). Drizzle liberally with the coffee syrup. Add another layer of the cream, cake, syrup and a final layer of cream. Cover with clingfilm and chill for a good couple of hours. Serve from the fridge, perhaps scattered with white and dark chocolate shavings.